Money. It’s a serious subject for many students and parents as they begin their college search. As families assess their ability to pay for a quality education, the opportunity, and perhaps the need, for the student to work during college should be part of the conversation. The money a student earns while working during college may be an important part of the plan to pay for their education. Whether students are responsible for part or all of their educational expenses, a part-time paycheck can reduce or eliminate the need for student loans. Other students may work to earn extra spending money needed to enjoy experiences outside of the classroom. Students might also find work-study (through part- or full-time jobs on or off campus) is a part of their financial aid package. Regardless of the reason, beginning a campus-based job—as early as first semester freshman year—builds a foundation for success in the future. Students receive benefits in other areas of their life in addition to monetary value when working a part-time campus job. According to research in the Journal of Population Economics, students who work up to 20 hours per week on campus earn better grades during college. Students who work can learn strong time-management skills and make connections across campus that can help them succeed. Many types of jobs exist across college campuses as well as in the surrounding community. Pam Ehlers, Director of OSU Career Services, reported more than 5,000 student employees work at Oklahoma State University each year. Students can work with faculty members in research labs, which may lead to recommendation letters for future endeavors such as medical school applications. Others may work in campus offices unrelated to their major, giving them an opportunity to build relationships with faculty and staff who will help guide them on their college journey and beyond. Each job, related to their major or not, provides students with workplace skills that are invaluable when they begin searching for full-time employment after graduation. 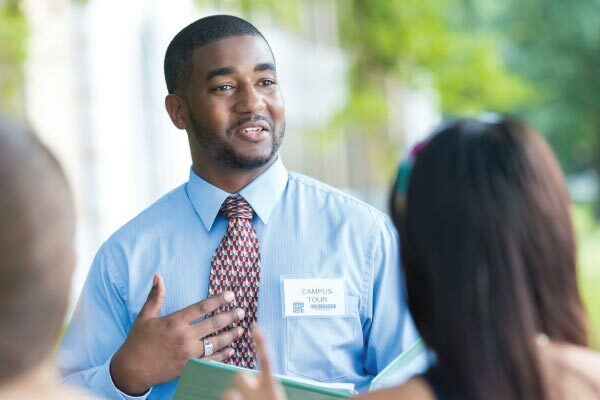 Finding a job on campus is an easy process for students. Each school is different, but at OSU, all enrolled students have online access in order to research and apply for jobs. The Career Services Office also holds a job fair each fall where students can meet with prospective employers on campus and in the community to learn more about available positions. Many jobs have minimal or no qualifications required for employment. College provides students with a number of opportunities to get involved and build their résumés. Taking part in or leading campus organizations is one way to build relationships and gain substantial experience. Although extracurricular involvement is an excellent resource and an important aspect of college life, part-time work can help a student stand out from their peers in an applicant pool. If students are looking for additional ways to fund their education and build experience, working on campus is an excellent opportunity. The responsibility of a part-time job will build contacts, teach applicable skills, set them up for success in the future, and provide additional income. So the real question may be: when can you start? Here’s a preview of a few campus jobs you might encounter, told by the students who are living and learning from them. I show parents and incoming students around campus. I answer questions and try to introduce them to OSU. The campus tour is the most important step for a student when deciding where they want to get their education. It’s my job to show the heart of campus; the type of people we have here and the warmth they will experience as students. Working on campus is a great way to make money while also being able to focus on school. It helps you manage your time. I also live on campus, so it is easy to get back and forth from work to home. Also, with on-campus jobs, school always comes first no matter what. They allow you to schedule around classes and are flexible with test schedules. I assist with TV productions, travel with sports teams, run a camera during sporting events, and run machines in the control room during games. This was an opportunity I couldn’t pass up. First, I knew I would get a lot of professional experience. Second, I needed money. Scholarships only cover school stuff, so to spend money on other things, like adventures, traveling, or eating out, I needed some extra spending money. College is about becoming independent and finding yourself. Working on campus can be a huge step in the maturation process. Also, getting a job of any kind is good, but on-campus jobs have the best understanding of the workload that you have as a student. It can be a great steppingstone to full-time employment. In my job I assist with medical care of the animals and help with graduate research as well as studies for other companies. I am able to gain large-animal experience that I would have never had otherwise. It’s good experience, but I’m also trying to pay for school and for my living expenses without any student loans. This job is tremendous. I would recommend that students work on campus! They pay fairly, they work with your schedule, and you have the opportunity to gain valuable experience either in your field of study or just work experience in general. When you get out of college, aside from your degree, work experience will be one of the most valuable assets that future employers will look at.